Are the Republicans in civil war or in the middle of an evolution? Sen. Robert A Taft (1889-1953) says it need not be the former and can be the latter. Taft, known in his day (the 1930s through ’50s) as “Mr. Republican,” possessed a personal background strikingly pertinent to the current moment. He was establishment with a capital E—not just Yale and Harvard Law but a father who’d been president. And yet he became the star legislator and leader of the party’s conservative coalition, which had a certain Main Street populist tinge. Taft contained peacefully within himself two cultural strains that now are seemingly at war. In his personal style he was cerebral, courtly, and spoke easily, if with limited eloquence. The secret of his greatness was that everyone knew his project was not ” Robert Taft ” but something larger, the actual well-being and continuance of America. His peers chose him as one of the five best U.S. senators in history, up there with Daniel Webster and Henry Clay.What would he say about today? Why did they call you “Mr. Republican”? 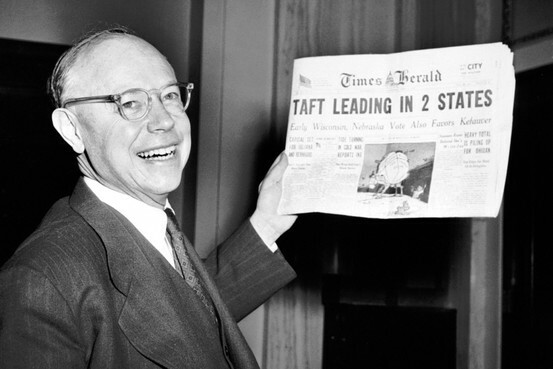 Ohio Sen. Robert Taft during the Republican presidential primary in 1952. The tea party, in contrast, seems to him to be “trying to stand for a free citizenry in the age of Lois Lerner. They’re against this professional class in government that thinks we’re a nation of donkeys pulling their wingèd chariot. But the tea party has a lot to learn, and quickly. “It’s not enough to feel, you need strategy. They need better leadership, not people interested in money, power and fame. Public service requires sacrifice. I see too many self-seekers there.